fancy dress balls | Enough of this Tomfoolery! One of the main displays in the current exhibition at Chatsworth House is about the Devonshire House Ball of 1897. The Great Chamber contains displays pertaining to the ball together with life sized images of some of the famous guests at the ball such as the Duke and Duchess of York (the future King George V and Queen Mary), Victor Cavendish (the future 9th Duke of Devonshire) and Mrs Arthur Paget, while next door in the State Drawing Room was a display of some costumes worn during that evening. The ball was held at Devonshire House in Piccadilly, London on the 2nd of July, during the height of the London Season. What made this ball special was that it was held in honour of Queen Victoria’s Diamond Jubilee and as Deborah, the 11th Duchess observed, at a time when there were balls almost every night during the height of the Season, for a ball or event to stand out and generate interest, it had to be special. And indeed it was special – invitations were sent out and the dress code was “allegorical or historical costumes before 1815”. This was an encouragement to the guests to give their imaginations full rein for the costume that they planned to wear that evening. His appearance and bearing also masked a complicated personal life. A bachelor of many years standing, he carried on a long term affair with Louise Duchess of Manchester but during the 1860s was also involved with the noted courtesan Catherine (“Skittles”) Walters who was known for her prowess as an equestrienne and on the hunting field. The then Marquess of Hartington was smitten with her, provided her with a home in Mayfair and together was openly seen out and about in events such as the Derby. As Sophia Murphy observed that, Lord Hartington “made no secret of his love for her” but in the end their affair was mentioned in the papers (albeit in the form of coy blind items) and coupled with the weight of disapproval from the highest echelons of society, the affair ended, but he made sure that she was well provided for. Catherine for her part, left for France, only returning to Britain once memories of the affair had faded, and her discretion was rewarded by the Cavendish family who carried on forwarding the annual sum promised to her until her own death in 1920. The main driving force behind the ball was Louise Duchess of Devonshire. Known as the “Double Duchess” because until only a few years before, she had been Duchess of Manchester. Born Louise von Alten, she was the daughter of a German count and in 1852 had married William Drogo Montagu Viscount Mandeville, heir to the Duke of Manchester. Three years later they became Duke and Duchess of Manchester. Beginning in the 1860s, she began an affair with Lord Hartington with the full connivance of her husband; their affair followed the usual pattern, it began long after she had provided her husband with the requisite sons to carry on the family line and was conducted discreetly among the whirl of dinners, balls, teas and shooting parties. Louise also maintained her dignity even when Hartington had other women and she never allowed her affair to threaten her own relationship with her husband. Such behaviour today would be seen as hypocritical but they scrupulously observed the rules governing their class and so long as those rules were observed there was no scandal and everything went smoothly. Louise quickly assimilated into her adopted country and through her entertaining advanced the political careers of both husbands. Although all her life she identified with her first husband’s political party, the Conservatives, her circle of friends and acquaintances was politically diverse. She didn’t hesitate to ensure that her dinners and balls were filled with leading politicians, regardless of their political affiliations and persuasion; her objective was that her home should be a meeting place for politicians of all stripes where they could talk in a more relaxed atmosphere away from the pressures of Westminster. Above all, she wanted to be surrounded by people who were interesting and who she liked and to ensure that they had a good time. She also gained a reputation for being a skilled political hostess who became a sounding board for leading politicians and statesmen, and although she was dismayed that the 8th Duke of Devonshire three times turned down the opportunity to become Prime Minister, his status and wealth as well as his ability meant that Louise could entertain in style and befitting their position in the social and political life of the country. Louise’s marriage to the 8th duke which finally happened in 1891 meant that her position was more secure. As Duchess of Devonshire, she was chatelaine of seven houses (Chatsworth, Devonshire House, Bolton Abbey, Lismore Castle, Hardwick Hall, Chiswick House, Compton Place) and had large funds at her disposal which meant that she had a wider scope for her social talents. Esther Simon Shkolink in her study of late Victorian and Edwardian political wives noted that contemporary accounts were more or less unanimous in their praise of Louise’s entertaining with her “charm and attentiveness as a hostess but also her careful attention to detail.” Her guest list was always eclectic and came from different political parties and social classes as the Devonshire House Ball would later demonstrate. The Devonshire House Ball in honour of Queen Victoria’s Diamond Jubilee was part and parcel of Louise’s pattern of entertaining. 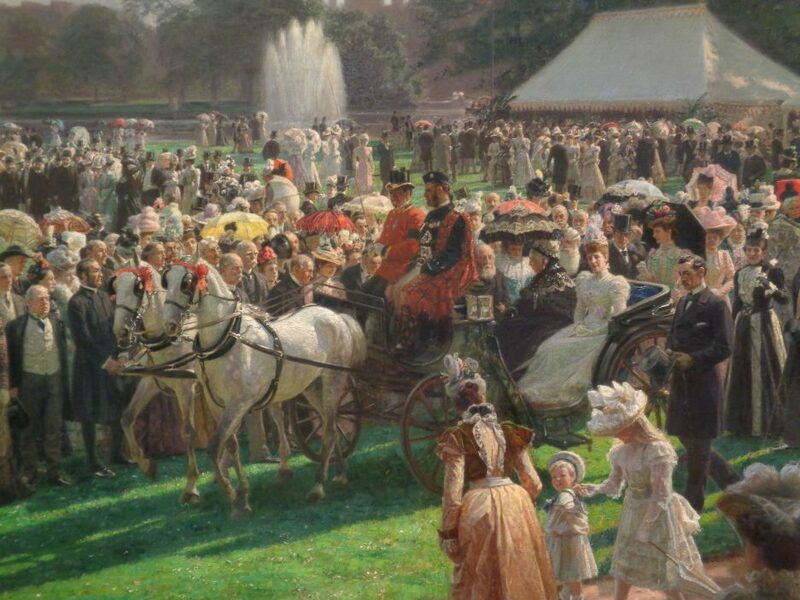 She and the Duke were fond of horse racing and annually held a dinner and a ball during and after Derby Day, regularly entertained the Prince and Princess of Wales (later King Edward VII and Queen Alexandra) and gave lavish parties for special occasions, but the Diamond Jubilee gave Louise the idea to push the boat out – throw a ball but with a twist in the form of a fancy dress party. Fancy dress balls had been a fixture at least since the sixteenth century; costumed masked balls were popular in Italy, particularly Venice, from where they spread to the rest of Europe. During the eighteenth century, they became popular at the various royal courts, especially in France, while in Britain costume masked balls were ticketed events held in pleasure gardens and assembly halls in major cities such as London and Bath. In these balls, attendees would usually be cloaked and masked (either with one covering half their face or one trimmed with silk or lace to cover the whole face) or dressed as characters from the past or from popular entertainment such as the commedia dell’arte. In the nineteenth century, theme balls became popular – Queen Victoria and Prince Albert threw three lavish themed costume balls during the 1840s and 1850s. The first was a medieval ball where the hosts and their guests were dressed in the style of the court of King Edward III; the second featured a Georgian theme while the last, held in 1851 had the court of Charles II as the subject. As Queen Victoria withdrew from social life following the death of Prince Albert, the mantle of royal entertaining passed onto her oldest son the Prince of Wales and his wife Alexandra, and during the 1870s they hosted a lavish costume ball at their London home Marlborough House which was heralded as a success and ensured the continued popularity of such events. Fortunately help was at hand. Due to the popularity of fancy dress balls, there was a plethora of books and specialist hire shops on hand to offer advice. One such book was entitled Fancy Dress Described or What to Wear at Fancy Balls by Ardern Holt and it went through several editions. It gave descriptions of the most popular costumes which ranged from historical personalities to characters from fiction, myth and legend down to allegorical and national costumes from various parts of the world. In addition, the book also gave recommendations of what costumes would suit a particular hair colour, skin complexion and age. The ball was eagerly anticipated and as Sophia Murphy observed that “[a]n invitation to the fancy dress ball confirmed membership of the ‘smart set’, and was therefore much sought after. Apart from this, everyone was eager to witness what promised to be one of the most lavish spectacles of the century; since it was the main subject of interest that season, everyone wanted to have the fun of trying to keep their outfits a secret while at the same time trying to discover what the others were wearing.” Many of the guests came together as a group and organise a procession and in the end five main groups or courts were organised: Elizabeth I of England which was led by Lady Tweedmouth; Maria Theresa of Austria under the Marchioness of Londonderry; Queen Guinevere & the Knights of the Round Table led by Lady Ormonde (she ended up being unable to attend due to bereavement so Lord and Lady Rodney went as King Arthur and Queen Guinevere); Louis XV & Louis XVI of France under Lady Warwick (as Marie Antoinette) and the court of Catherine the Great of Russia led by Lady Raincliffe. Three other groups more loosely defined were categorised by the costumes they were wearing such as the Italian, Oriental and Allegorical. Many other guests however decided not to join any group or procession as they went in an assortment of costumes ranging from their ancestors to those modelled from famous paintings or historical figures that did not fit into any of the groups or courts organised. With her customary attention to detail and zeal, Louise planned everything down to the last detail and even the servants on duty were in costume – the men were dressed in in Devonshire livery from the 18th century while the female staff were dressed in costumes from the Elizabethan period. Due to the large number of guests, it was necessary to hire outside staff for the night and Louise had them dressed in either Egyptian or Elizabethan dress. One of the guests Margot Asquith (wife of the future Prime Minister Herbert Asquith) expressed surprise at her host’s choice of costume. For her, Zenobia evoked beauty and romance but Louise in her view was neither. In her youth, Louise was known and praised for her beauty but as she grew older, her looks faded while her features became coarse and her figure grew rounder. As Duchess Deborah wrote: “The ‘Double Duchess’ was considered a great beauty, though with her frizzed up hair and short, thick neck it is hard to recognise her beauty in most of the likenesses we have of her. The people I have talked to who saw her only remember the crazily cracked make-up plastered thickly over her face, which made a bizarre effect on this grande dame receiving at the top of the staircase at Devonshire House.” Her costume was designed by the House of Worth and such was the skills of that venerable fashion house that they managed to make Louise a stately and imposing Queen of Palmyra rather than fat and coarse. The Duke of Devonshire was dressed as the Holy Roman Emperor Charles V based on his portrait by Titian and keeping up with his modest tastes, the Duke’s costume was simple and the only adornment was the badge of the Order of the Golden Fleece which had been lent to him by the Prince of Wales for the evening and which the duke wore around his neck. As the ball was in honour of Queen Victoria (who did not attend), she was amply represented by members of her family. The Prince and Princess of Wales (who were costumed as a Grand Prior of the Order of St John of Jerusalem and Marguerite de Valois respectively) together with their children and in-laws attended as well as the Duke and Duchess of Teck and Prince Alfred of Edinburgh and Saxe-Coburg-Gotha. Foreign diplomats such as the Portuguese ambassador the Marquis de Soveral (a close friend of the Prince of Wales) and the Austrian ambassador Count Albert Mensdorff were also present and it’s no wonder that with such a guest list, the Devonshire House Ball was seen as the event of the 1897 London Season. Many guests did take much time and effort with their costumes. It was said that one guest who wore an Oriental dress wanted to make an entrance via an elephant and enquired London Zoo about the possibility of borrowing one. The zoo authorities however refused on the grounds that the elephant would be unable to cope with the crowds and traffic of London. One can simply conclude that she made her entrance via the usual horse and carriage. Others in their desire for accuracy and to stand out suffered through the evening with uncomfortable headdresses and props – such as the Hon Mrs Reginald Talbot who went as a Valkyrie and who developed a headache due to the metal winged helmet she was wearing but refused to take it off as it might ruin her hairdo. There was the Countess of Westmoreland costumed as Hebe cupbearer of the gods who was restricted with her movements the entire evening due to the huge stuffed eagle on her shoulder: while Lady Wolverton who attended as Britannia would have had to contend with not only a feathered helmet but also a triton and shield. While some male guests such as Herbert Asquith went to the ball grudgingly and made little effort with their costumes, others threw themselves wholeheartedly into the spirit of wearing fancy dress sometimes with even more enthusiasm than their wives. One of the most expensive costumes was worn by the 9th duke of Marlborough who went as the French Ambassador in one of the courts. It was made by House of Worth, a confection of velvet embroidered in silver, pearls and diamonds with a waistcoat made out of white and gold damask. The whole costume was mostly embroidered by hand as well as the pearls and diamonds and cost 5,000 francs. As Jean Philippe Worth later recalled, even he was shocked by the bill as he presented it to the duke. Outwardly the ball can be seen as the pinnacle of aristocratic dominance both in the political and social scene but in reality, the ball reflected the gradual changes happening in society. It was observed that society was “less clearly defined than it had been twenty years before” and the guest list reflected Louise’s wide circle of friends and acquaintances that crossed the political divide. More crucial however was the presence of men and women whose origins and occupation would have barred them from other aristocratic homes but who were invited to the Devonshire House ball while most of the aristocratic old guard were not. Examples of these were Ernest Cassel and Alfred Beit both of whom were Jewish and were in banking; the Earl of Iveagh and Lord Rothschild both of whom made their fortunes in commerce and finance; the actor Sir Henry Irving and the American born singer Mrs Ronalds who appropriately came as Euterpe, “the Spirit of Music” in a costume decorated with the musical score from Verdi’s opera Un Ballo in Maschera. The ball in 1897 was the last major event held in Devonshire House and with the 8th Duke’s death in 1908 followed by Louise three years later marked the end of an era for the Devonshires. The 9th duke was faced with crippling death duties from his predecessor’s estate as well as debts from the 7th duke’s failed investments. In order to economise, the 9th duke accepted the position of Governor-General of Canada where he served from 1916 to 1922. While in Canada, negotiations for the sale of Devonshire House had begun and it was finally sold in 1920. Not long after the house was demolished and an office block now stands in its place. The sale of Devonshire House showed that following the end of the First World War not even the grandest and wealthiest of the aristocracy were immune from the changes sweeping through the aristocracy as well as feeling the financial pinch. In the years following the sale and demolition of Devonshire House, other aristocratic townhouses were sold to be demolished, converted into office spaces or museums. At the same time, aristocratic entertaining also changed – many in the aristocracy could no longer afford to entertain on the same scale as their predecessors and balls and dinners were ceasing to become extensions of cabinet meetings and parliamentary sessions. The Devonshire House Ball of 1897 would certainly be the last of its kind and one that would never be repeated.